in Paris. 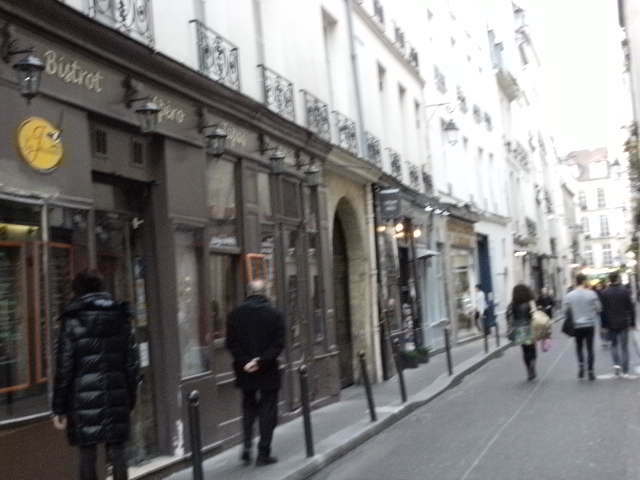 This is my favorite area , and where I stayed as a tourist, and rented my apartment. The 3rd & 4th , are small areas on the map ,but big in culture, and connivance. Let us start with some basic facts and background about the area. The 3rd and 4th share the area called ‘the Marais’, which is swamp in French. Now, living here, I understand, Paris gets a lot of rain, so its easy to see this area becoming very muddy. With no medieval sewer system, I can see how it became muddy. However the word swamp ?? This is not even close to our Florida Everglades – now that is a swamp! The buildings architecture reflect this modest history, with small balconies and the streets are narrow, to allow a horse and carriage to pass. 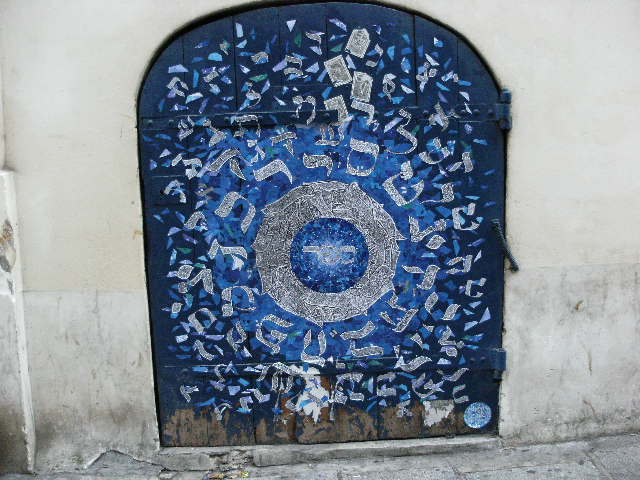 There are lots of artistic paintings on the buildings, to share the rich jewish culture here. 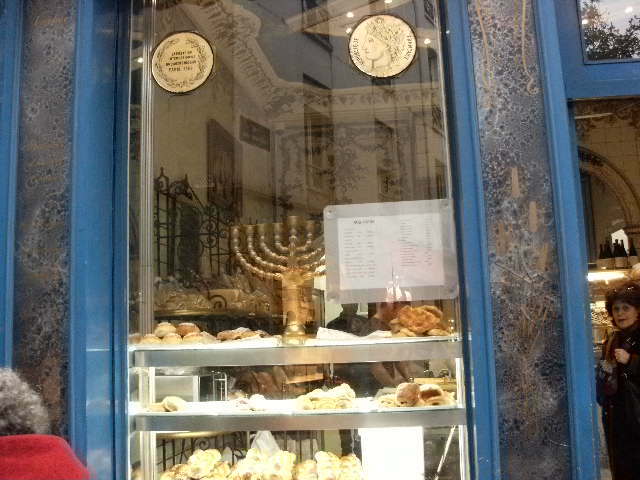 This is a famous bakery in the area – usually a long line to get inside, to purchase the wonderful smelling breads. 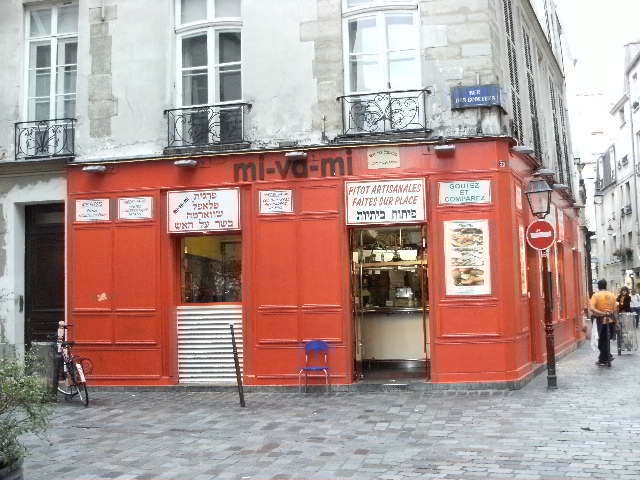 The old stores are Jewish merchants, and restaurants which serve a modest meal in a modest price range. 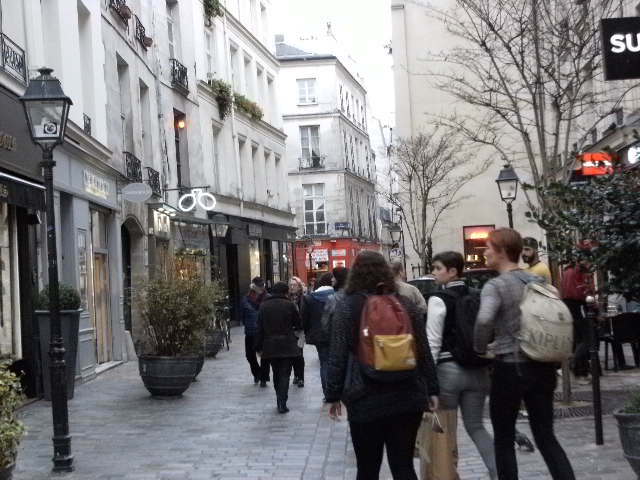 Its walking distance to the Notre Dame, Marie du Paris, BHV – the biggest department store in Paris, Ile St Louis and countless boutiques and cafes- so a perfect place to stay! 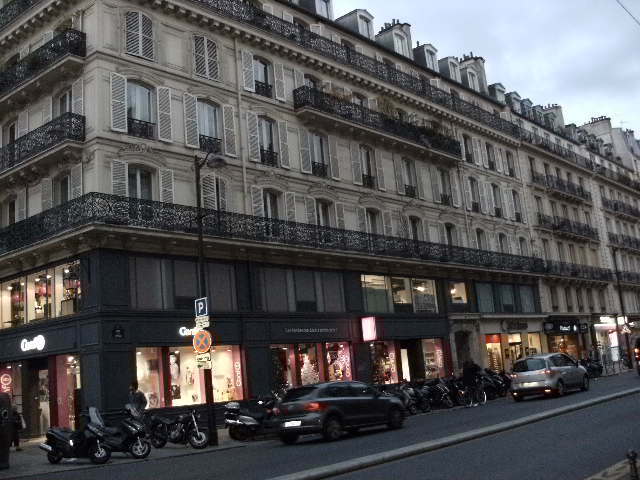 lining the shopping areas – a smaller copy of what the Grand Boulevards look like. 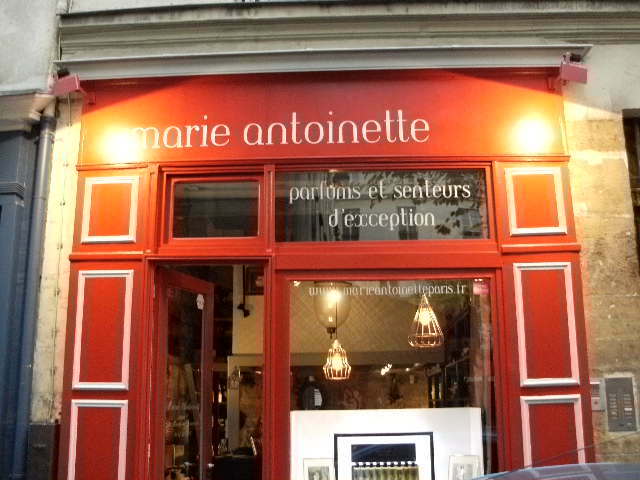 I travel here, to my favorite 2 vintage stores. 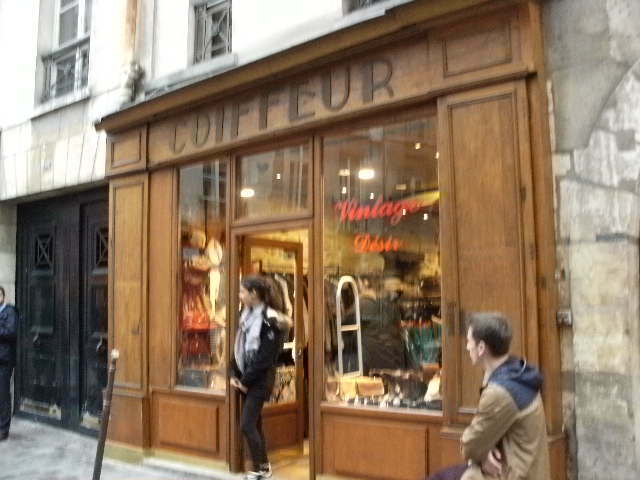 One is incognito with a Coiffeur sign – but inside are wonderful finds- one clothing item, that is new to me, but vintage – is the cape. I purchased a large light blue cape with bottom fridge for 15.00 I find this perfect for days when I am in & out of the car – since I only need a cover until I get inside the store, once in the car, its easy to remove off my shoulders. 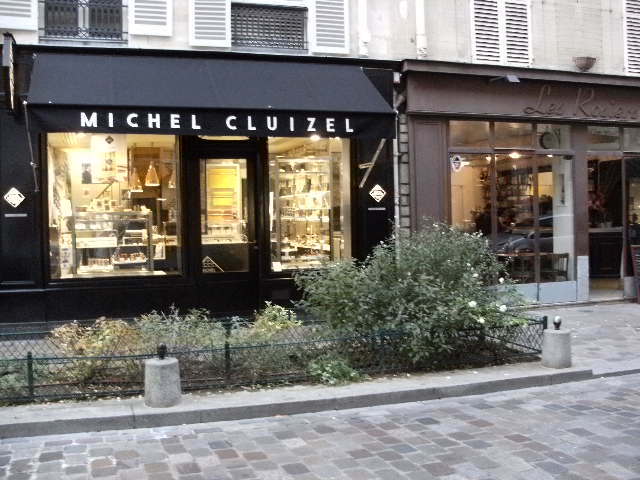 This store is on Rue Rosiers, which is a shopping street, closed off from cars. 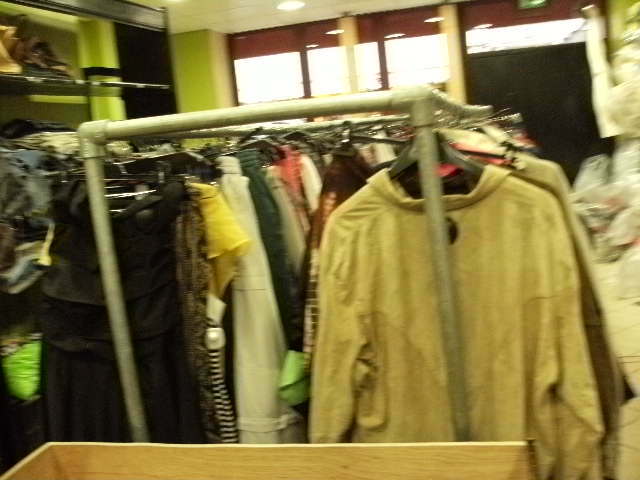 My other vintage store is on Vie. 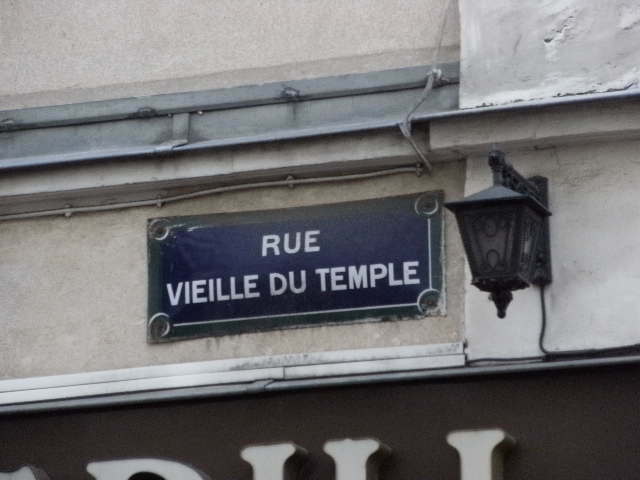 du Temple. 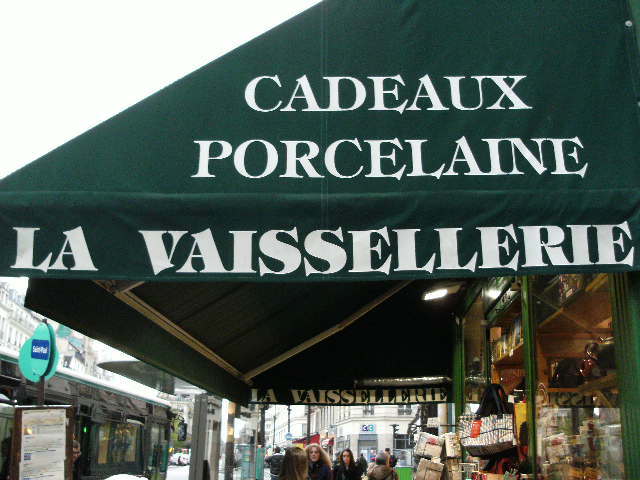 This store is larger than the first one, but has more ‘stuff’ , scarfs, bags, hats, etc. 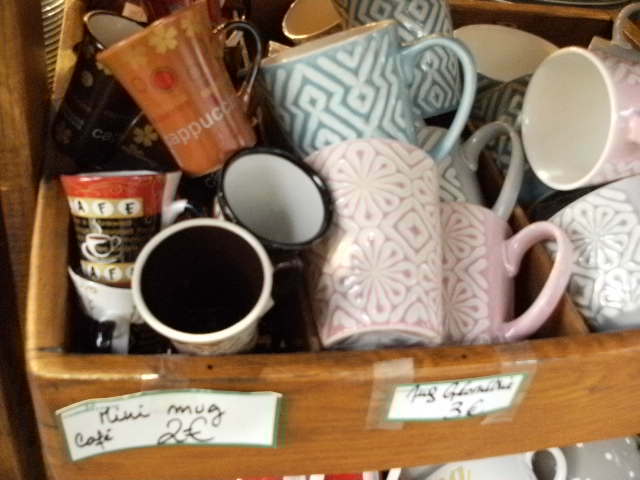 BUT I will tell you – they do NOT size in these stores, so make tile to sort through the racks – they are not organized at all. 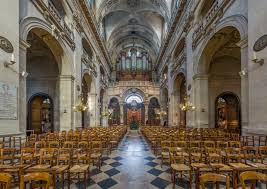 As for churches in this area, the world famous one is NOTRE DAME, and since there has been novels & musicals written about this wonderful church – I will just say – its on everyone’s ‘ must see ‘ list for a reason – it’s a beautiful 800 year old masterpiece . 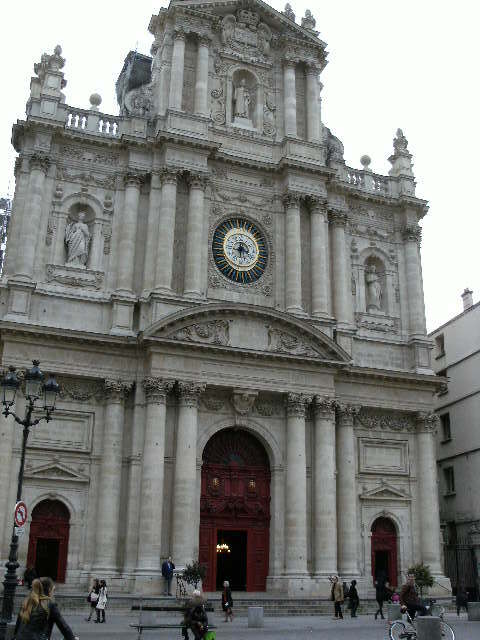 So instead I will write about the church that is the “anchor” of the area – ST PAUL .its a grand looking church with bright red doors- it off sets the ancient gray stones. 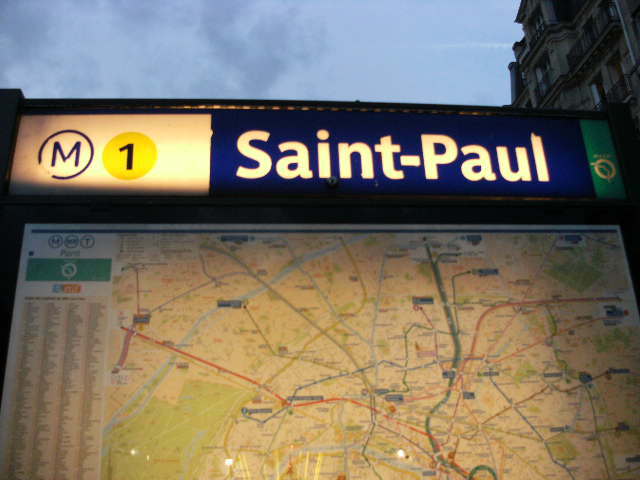 St Paul’s is in the middle of a very busy section of Paris, and its also, the name of the Metro stop. 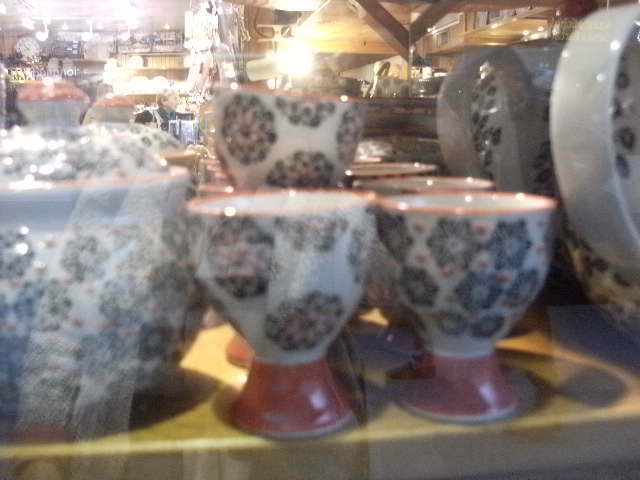 Walking around, you will find lots of activity, cafes and stores, surround the busy area with daily shopping. Once the big wood doors close- you are transferred into a very quiet world. The stone floor is uneven, from decades of people walking the same path inside the church. 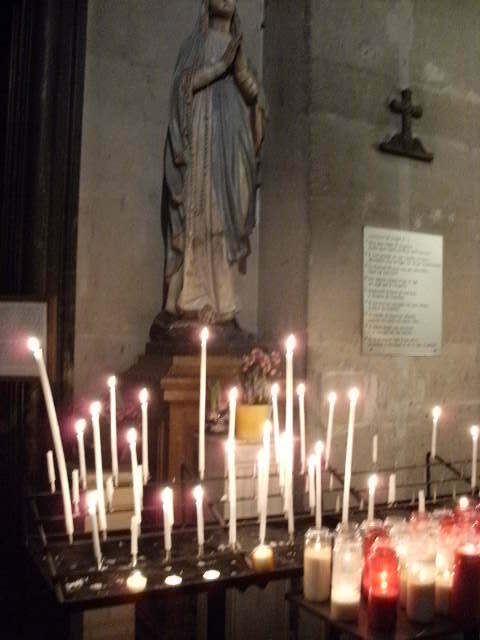 As I approach the St Mary’s alter, I decide to light 2 candles one for Auntie, and one for my grandparents. The flame is started by touching my candle’s wick to another candle’s flame. This is how, its been done for decades, my grandmother use to show me, when we went to church together. And how her mother taught her – so it goes.. faith works like this too – one touching another.. for over 2000 years. Moving towards the alter, the smell of traditional incense fills the air. I just missed afternoon prayers. Some older people linger in the pews, collecting their things slowly.. hat ..reading glasses.. in no hurry to leave this refuge. In no hurry to return to the busy world that awaits outside. 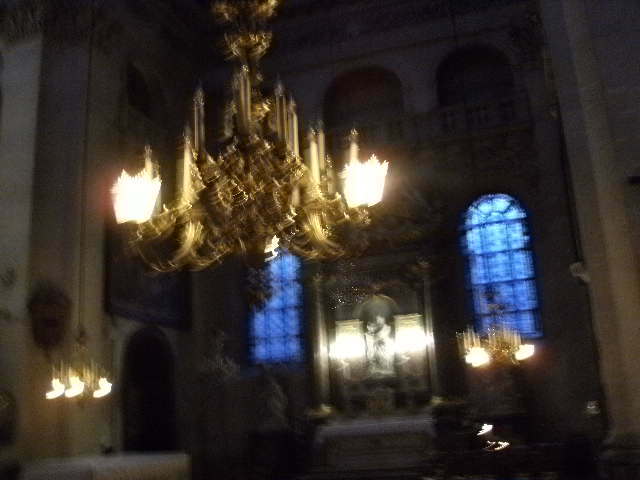 The heavy ornate chandeliers give soft lighting to this 1627 year old church. 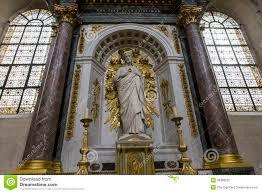 The alter sits in a soft light, from the high windows, the gold leaf gleams brightly – catching your eye. I let my eyes adjust – and marvel at the beauty of the white marble alter. I still have my childhood training, which forbids me to pass any further- that area is reserved for Priests. 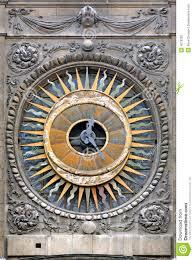 As I depart the church, I glance up at the beautiful clock –this use to be placed on the churches, for people to know, when it time for Mass. Its 4.30, and the sun has fallen behind a cloud, and the wind has picked up a chill. 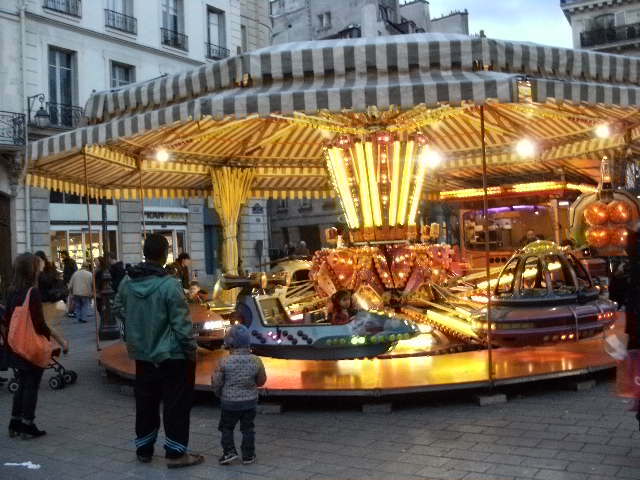 I walk toward the Metro, eyeing the Merry Go Round.. with children waiting for their turn on the ride… there is something poetic about that ride – you get on a horse, and ride and ride, but in the end – go nowhere, new. 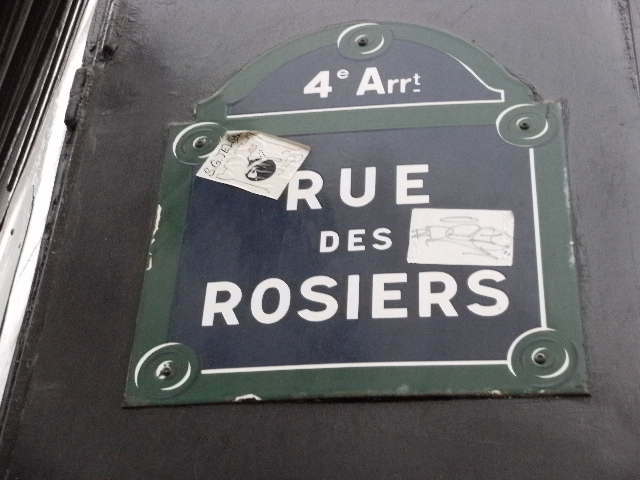 I pull my beret down over my ears, from the cold air..walking to my metro ride..